A glimmering bronze statue of a lion balances impossibly on one paw at the entrance of Balboa Park in San Diego. Its carefully sculpted body showcases rippling muscles, flowing mane and a face that casts a majestic gaze, welcoming onlookers as it is poised to land with grace. This is Rex, a tribute to the legendary lion whose “roar” was the light bulb, so to speak, that piqued the interest of San Diego physician Dr. Harry Wegeforth and inspired the rise of the San Diego Zoo. That was over 100 years ago. 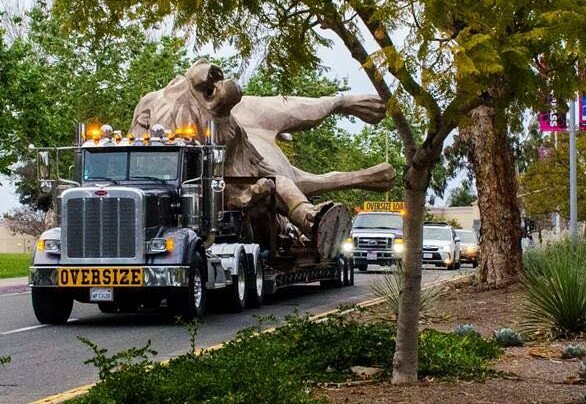 Now, Rex is back, immortalized as a 27-foot-tall statue, weighing more than 20,000 pounds. It is the largest cantilever bronze animal statue in the world. Rex is no doubt an impressive engineering marvel. In fact, it took thousands of hours to bring him to life. There were a number of challenges to face, from deciphering how to erect a statue of a lion balancing only on one foot, to the best materials to use and finally- how to pack and move Rex to his new home. That’s where Bill Signs Trucking came in! When you take a long, hard look at that behemoth of a lion, can you imagine it cruising down the highways of Southern California? You might be scratching your head, as you puzzle over mathematical equations and the laws of gravity. 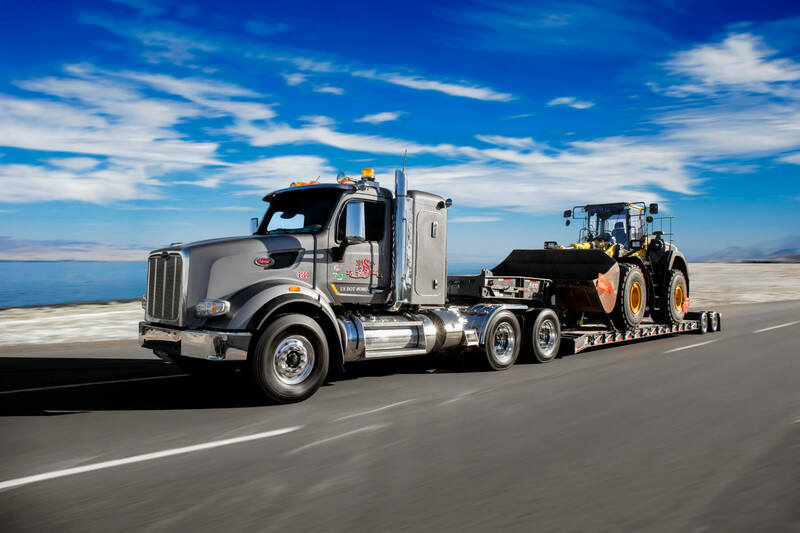 Heavy haul can seem like a daunting task, but with a confident and experienced logistics team behind you, anything is possible. At Bill Signs Trucking, we possess years of honed skills, following stringent rules and taking precautions when planning the transport of an over-sized load. Our driver, Doug Benson, undertook the feat of transporting Rex hundreds of miles from Richmond, CA to the San Diego Zoo. 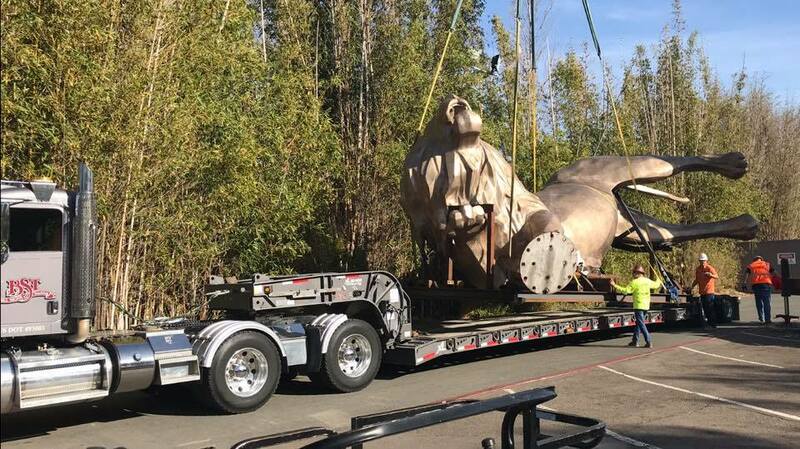 In order to make the magic happen, intricate steps were taken to ensure permit regulations were met, the statue was packaged and loaded to avoid damages and routes were chosen with care. There were several factors to contemplate and nothing can be overlooked for the sake of safety. As Benson hauled Rex over the road, bridge dimensions had to be considered. As well, wind could potentially rock the load or blow the trailer from lane to lane. At one point in the journey, a couple of tires blew out, causing a short delay. To overcome obstacles, measurements of the load were taken to determine how Rex’s unique shape would fit within the lanes and under bridges. Pilot cars were used to keep traffic away from the load and also to alert Benson to any road hazards obstructed from view. With Benson’s expert driving, Rex made it to Balboa Park safely without a single scratch and the haul was a smashing success! Call 619-277-7447 or email us for a your logistical solution.